Cold lasers are highly effective in treating a wide variety of problems. 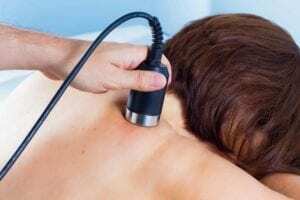 Laser treatment is a technology that was once offered only to elite athletes, today cold laser treatment is readily available through highly trained medical professionals, including chiropractors. The majority of therapeutic lasers are used to treat damaged tissue and structural issues in the bones, joints, and ligaments. The use of cold laser treatment can be done alone, or combined with chiropractic, fascial work or flexion/distraction. It is a short, focused and PAIN-FREE option to decrease pain and heal injuries. We are seeing that the use of laser to treat trigger points, acupressure points and lymph nodes is rapidly growing. With this more focused approach, we see decreased pain and swelling and increased healing at rapid rates. Dr. Massey is amazing. I came to her with a back muscle pull that was in a bad spasm. Dr Massey spent time with me figuring out what happened, and correcting misalignment using cold laser and muscle relief. By the time she was done I could stand up again. By the next day, I was back running my boot camps. The cold laser therapy offered by Dr. Massey at Infinity Wellness Center operates at an 830nm wavelength which is the optimum wavelength for efficient soft tissue penetration and maximum interaction with the mitochondria. The invisible wavelength of light stimulates each cell to produce more ATP in the mitochondria which is the fuel for the body at a cellular level. This allows for the cells to do their job more efficiently and heal/regenerate new stronger tissue in place of injured/damaged cells. This interaction with the cells reduces pain and inflammation at a cellular level to cut healing time in half. Cold lasers are cleared by the FDA for pain reduction, inflammation reduction and increasing blood flow. The ML830 was the first 3b laser with FDA clearance to market low-level laser therapy (LLLT) in 1990 for the non-surgical treatment of Carpal Tunnel Syndrome. Book an appointment HERE with Dr. Massey to see if your ailment would benefit from cold laser treatment.